Okuma model LB-6 CNC Gang Type Lathe with 5C collet Chuck, S/N 6201. Shizouka model 4020 CNC VMC, with Fanuc 18m control, 10,000 RPM, 18 ATC, 40 x 20. 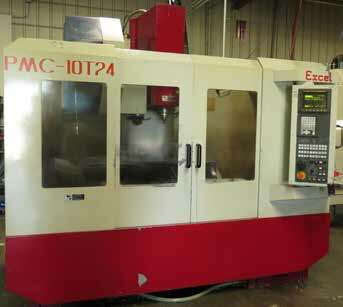 1996 Excel PMC-10T-24 CNC VMC, with Fanuc 21 M control, 8000 RPM, 24 ATC. Rotary air compressor with tank. Mori Seiki MV-35/35 CNC VMC with Yasnac Mxi Control, 20 ATC, s/n 240. KBC Horizontal Band Saw, 16’’ round Capacity model 6-271-025. Kaeser SM 11 Rotary air compressor, with krd 35 air dryer. Worthington 25hp rotary air compressor with tank. Porter Cable belt sander, buffer Grinders and etc.